2P has high abilities to help you expanding the scope of advertising that has become one of the strongest marketing tools in the modern era. We can provide the necessary support to strengthen the mutual relations between your institution and the media and turn it into an effective tool to reach the biggest segment of targeted audience. Media plays an important role in shaping public opinion among a target audience and parties involved in a business of any organization. Where various media work, including newspapers, magazines, audiovisual media, and e-news sites, act as custodians of the best and most influential brand information materials Target audience. Role of media is not only to promote brand awareness and create interest among the audience, but also to improve the image of a company or organization and its position in markets in which it operates. With public access to business and corporate information, media is a reliable and trusted external intermediary for the brand, contributing to public advocacy and support through positive and effective media coverage of the brand, and enhancing its credibility to audience. 2P has high abilities to help you expanding the scope of advertising that has become one of the strongest marketing tools in the modern era. We can provide the necessary support to strengthen the mutual relations between your institution and the media and turn it into an effective tool to reach the biggest segment of targeted audience. 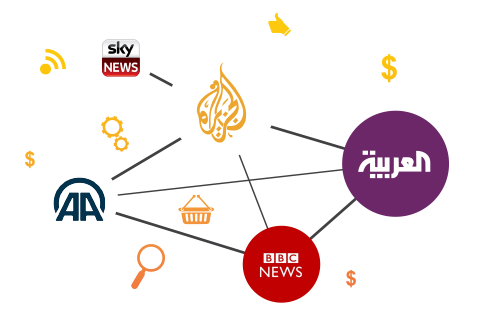 Our extensive network of solid relationships contributes with media creating the ideal environment for you to establish strong and sustainable strategic partnerships with media and gain a better understanding of how to communicate effectively with journalists and media professionals at the regional and international levels. Because the importance of managing media relations is reflected in delivery of facts, knowledge and ideas to different segments and in multiple ways, 2P seeks to be the best choice for those who seek to communicate their voice to others through a solid network of relationships, It has been documented for a long time with leading media outlets of Media, journalists and producers,to ensure proper media appearance for our clients properly and permanently on the media, and cover news and achievements in an appropriate way, reflecting the true image and positive reputation of a press release rather than a marketing that enhances the credibility of media coverage of your business. Our experts team of media relations at 2P has the ability and knowledge how to make a story in Arabic, Turkish and English, as well as their full knowledge of how the story is made, and therefore they have established close relationships with individuals in the media who care to speak about these stories. Each year, the group runs a number of media events, which include collection of more than 100 media representatives. Our team of managers works closely with customers to ensure that expert executives are provided with the information they need and provide them with the required media support. Absence of a press role among cadres of foundation or organization It can be remedied through this service, which provides Foundation with briefs, brochures, newsletters and press releases on role of Foundation in providing this sector with its needs, in addition to its impact on it. We work at 2P to build direct and personal relationships between prominent media and our clients from companies, foundations and organizations, which allows them to open new channels of communication that enable them to enhance media coverage of their stories, news and achievements. 2P Media Relations team is responsible for distributing press releases and providing media coverage for specialized articles and interviews in many prominent media locally, regionally and globally such as newspapers, magazines, radio, television channels and news websites. This service includes process of connecting between organization and its audience through integrated events that are compatible with the events and objectives. It is managed efficiently and effectively in terms of linking its activities with media, which is an important platform for communicating the voice of any institution in the community. 2P Media Relations Group providing the following: coordination of interviews and media statements which are published on various print, video and audio media, as well as field support during the event. which are organized by your company or organization, such as product launches, celebrations, forums or conferences. As soon as we start collaborating with a new customer, 2P Media Relations Team starts analyzing the customer’s SWOT from point of view of media, by gathering their views and perceptions about the brand and its position in the community. 2P Media Relations Team conducts a media briefing of customer news that has been distributed in advance to better understand the direction of the news and to determine whether the method needs to be improved. Media monitoring is carried out by monitoring the results achieved to disseminate customer’s news and stories through print, video, audio and web media. In addition to the above, a company provides its clients with various published information materials related to their work, each according to its sector. As the company responsible for the media relations of its customers, 2P provides practical training to representatives of companies and institutions and senior management members to prepare them to face the media with confidence, especially during times of crisis.